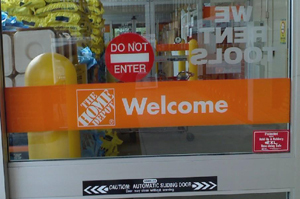 March 2009 This is one of the doors leading into the Home Depot where I've spent way too much time over the years picking up stuff for Habitat. The store is right across the street from the Falafel sign store one Fun Pic back. Anyway, as you can see, there's a big sign in its official shape and colors saying unequivocally, "DO NOT ENTER." And immediately below that is a sign saying, "Welcome." Wouldn't you think someone at the store would have noticed this? Update of March 2011 Just beyond that door, as you exit, is the loading zone, as evidenced by this sign. It clearly designates this area as a loading zone, where you'd pull in and stop and park and load stuff into your vehicle, right? 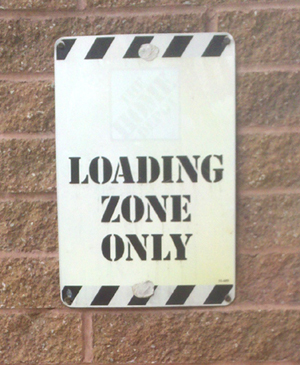 Well, hover over this LOADING ZONE sign to see another sign, just a few feet away, referring to this selfsame loading zone.